I was asked to give a guest sermon at the Unitarian Universalist Church of Palo Alto when the parish minister was at the church summer retreat. There was no set topic, so I decided to write about Principle Five of the Seven Principles. Essentially, I ask what Principle Five really asks of us, and argues the need to promote economic democracy, socialism, worker control, whatever you’d like to call it. Given September 14, 2014. Should you have time to do some real, intense, dedicated pondering, the Seven Principles of Unitarian Universalism is dynamite daydream material. They represent the foundation of a moral philosophy; ourselves, our church, our societies emerge from that foundation. This morning I’m going to take one principle and explore its meaning and potential. Principle Five recognizes that the community supports “The right of conscience and the use of the democratic process within our congregations and in society at large.” Those last five words- “and in society at large.” It is not a specific checklist. Rather, it urges us to evaluate the whole interdependent web of existence that we find ourselves a part of. That phrase compels us to dream big. Envision a world nourished by the roots of democratic freedom. As a sociology student, the definition of society is important. To dive into Principle Five requires us to define our terms. Without clarity of language this journey would be like an astronomer trying to study the planet Saturn without knowing where it is or what it looks like. [pause] The word comes from the Latin socius, which can be translated as “companion” or “ally”. Society binds people together in friendship and trust. Hopefully, it should rest on our humanity and common feeling. Author Anat Shenker-Osorio wrote in 2010 “The belief that we are all competing with each other for scarce resources, that life is by nature a zero-sum game, ignores critical truths that rightly deserve the designation of ‘natural law’. Humans are a social species. We are pack animals; we like to be together lots of the time. Some of our greatest joys and oldest cultural practices involve sharing: our homes with a stranger, bread and wine with friends, material goods with our families.” The aspect of our lives where zero-sum thinking dominates, to the detriment of many, is the structure and culture of the economic system. Large business pursues optimal profits, with much collateral damage. Chemicals spill into the West Virginia water supply, jobs are moved from Ohio and Illinois overseas, retail workers are not given enough hours to qualify for full-time benefits. We are a part of the economy, the reason it exists, yet often we feel helpless and swept up in something beyond our control. This economic power then influences our political democracy. UUs for years have been working against the influence of money on politics, so the danger is well-known. Politicians driven by business interest cash often ignore their constituents. According to an October 2013 poll, Americans held a higher opinion of the DMV, hemorrhoids, and cockroaches than Congress. I am 24 years old and gridlock, both in this state and in Washington, seems natural. In society at large, everything is interrelated. If one aspect lacks accountability and popular control, it will harm the others. Without addressing core issues, attempts to build a better world will be undermined. There exist many proposed solutions for a more just economy, from the general public and UUs in particular. Much of today’s activism is built around making large businesses yield to the popular will. Some of you may get email newsletters asking you to sign a petition against Wal-Mart, or Exxon-Mobil. Bad behavior! Environmental waste! Corruption! Send them a message! It is a demand, we want a say, this can’t continue. At this year’s General Assembly, a high-profile resolution was passed, moving to divest from fossil fuel conglomerates. Our UU community aims to use economic power to create a sustainable society. Divestment is often linked with boycotts and sanctions to make corporations and whole states change their ways. California was host to the Delano grape boycott in the 1960s, where popular will forced powerful agricultural interests to stop exploiting migrant farm workers. Worldwide action punished South Africa economically for its vile system of apartheid. This all points to a desire for more democratic control in the American economic system, by workers of a particular business, and the general public who must deal with the fallout of business decisions. Both groups, employees and the communities they live in, must deal with the trauma of outsourcing, cuts to wages and benefits, and disregard for the environment. In a lifetime, the average American will spend 90,000 hours at work, but the typical worker has no say in how her company is run. Unions increase worker power, but their scope is limited, and less than 7% of private sector workers belong to one. The public company is run by a small board of directors and a small set of principal shareholders, who often are the same people. The UUA is part of an interfaith group that buys shares in companies to create pressure for reform. Such efforts can only go so far- corporate stock gives disproportionate power to holders of special types of shares. And the reality is that promoting economic justice may mean cutting profits and endangering stock price. Working within the system where profits are expected to increase indefinitely means calls for justice may go unheard. The world of privately-held companies lack any internal accountability. In the US, the largest private companies have $1.8 trillion in annual revenue and employ 6.2 million people. Their work can be damaging to humans and the environment. The two largest private companies in the country are Cargill, which sells palm oil and soybeans from areas that used to be rainforest, and the petroleum multinational Koch Industries. Not to despair. The world of today has never been inevitable. There is a place for the democratic process in the economy. Some existing businesses show a different way of doing business. There are cooperatives all around us, where workers and consumers get a say. Credit unions in America serve 44% of the economically-active population. They are community not-for-profit organizations, where account holders are the owners and elect their leadership. To have a say in a large banking chain, you need to purchase quite a lot of stock. You are not a part-owner of Wells Fargo or Bank of America just because you opened up a checking account. You are not consulted on their business decisions. Credit unions and other cooperatives are owned and run by the community, and their decisions by nature factor in the human element. The Manhattan board of a large bank doesn’t have to consider the effect of foreclosures or high interest loans on a small community. A local credit union does; the leadership and ownership live in the community, and must personally deal with the fallout of destructive policy. In the past year I’ve learned of an idea created by credit unions that shows the value of a democratic, community-run mindset. Several states now allow a contest called save-to-win. Most states have a lottery, with big prizes and lots of advertising. Lotteries are played by the poorest Americans, and few ever win. It is in some sense a poverty tax, where people are exploited by their hope for a better life. Save-to-win is simple: for every $25 put into a savings account, you get a raffle ticket for a drawing at the end of the week, or month, or year. It has created the excitement of a regular lottery, while increasing the savings of poor Americans. People are excited and motivated to save for their future. Credit unions have created a lottery where you can’t lose. This is a part of a society of companions and allies. There is more than the zero-sum, everyone can win and thrive. Cooperatives go beyond the local credit union or organic food mart. The Mondragon Corporation in the Basque region of Spain is a diverse organization with many cooperatives, divided into finance, industry, retail, and knowledge. They employ 74,000 people, and by company rule, no person can make more than 8 1/2 times the lowest-paid worker. In a country still devastated by the credit bubble, Mondragon has stayed strong. The economist Richard Wolff, who you may have spotted on Moyers and Company or Charlie Rose, has crafted an initiative called “Democracy at Work”, where businesses can be created that are self-directed by workers. A few years ago I saw him speak in Berkeley, and his words were invigorating. The framework for democracy in the economy, that largest component of “society at large” exists. There are realistic solutions. It is a matter of will. If companies were run by the workers, would their jobs and factories would have all been moved overseas? Or would they have taken initiative, and made the enterprise work here, whatever it took? Would a worker-run factory pollute the groundwater, when the leadership would have to come home and drink it? When we send petitions, or move our money, or boycott a company, we are demanding accountability. The best way to make the economy accountable to the people is to make the people accountable for the economy. The scene shows the importance of sacred places and sacred institutions. The Temple is the holiest place for the Jewish people, and it was being sullied by profiteering. Perhaps some things should be above profit. Our political democracy today is built upon profit, as special interest cash creates a skewed set of priorities for elected officials. We have our own secular temples, that we cherish and treat with special care, and perhaps the moneyed interests need to be driven from those places too. The best way to achieve democracy, a deep and encompassing democracy, is to change the way money is spent and businesses are run. The 17th of September will mark the third anniversary of Occupy Wall Street. If nothing else, the movement sought to link the economic power of the 1% with its political power and influence. The question of why Congress is less popular than cockroaches has a complicated answer, but money has certainly steered it to this point. When myself and fellow members of Occupy San Jose handed out flyers on how to join a credit union, and picketed banks, and along with local non-profits encouraged churches and small businesses to divest from large banks who were foreclosing on houses in their community, we had an idea that there may exist a better way of doing things. Perhaps there is a place for democracy in society at large. Professor Melissa Harris-Perry, MSNBC host and noted Unitarian Universalist (she wrote the foreword to the newest edition of the UU Pocket Guide), has walked off her show after being preempted again and again in favor on endless election coverage. Prof. Harris-Perry is one of the few black women with a major position in TV news. Often the “election coverage” that pre-empts her show is just showing stump speeches live and other things that could be ignored or condensed. I stand in solidarity with lack of respect for her show and the work she does. Her show has by far the most people of color as guests. News shouldn’t just show candidates yelling at each other. it needs to explore how their policies and ideologies will affect communities of regular people. Only through diversity can that be analyzed. Yesterday in the weekly meeting for Unitarian Universalist students on campus, our service leader gave us definitions of “personal brand.” The discussion was interesting, but I felt nobody delved into how much conflict exists between the concept of a “personal brand” and a UU worldview. Since there wasn’t a good opportunity to explore my feelings then, I’m writing a response now. Personal branding is emphasized in business circles, particularly among entrepreneurs. Just like with a traditional brand, participants attempt to broadcast a positive portrait of themselves, that uses whatever skills and resources they have. The idea, in theory, is to have a unique profile that makes you special. Advocates of this process say that everything you do contributes to personal brand- education, work, choices regarding romance and children. One definition says that you need to define what you really find important. But here’s the short-circuit. One thing you can value is not being bound by business concepts like brands. Thinking of people as brands is profoundly dehumanizing, and conflates personal identity with capitalist practice. Personal identity is broken up into quantifiable traits, because brands have no need for intangibles. “Value” is given a crass, narrow definition. Emphasis on personal branding- where everything, not just work-related, is crucial- fundamentally clashes with a spiritually fulfilling life. American capitalism is many things, but it is not a very spiritual realm. It is depressing to read my life trajectory described in five-dollar word business speak. To bring up personal branding is important- I think UU young adult groups should discuss it since it’s ever-present in the adult world- but not with a starting assumption that it’s a positive thing. That needs to be proven. Forbes is not the arbiter of what principles we should hold. Uniqueness is an empowering trait, but the flip side should be considered. Thinking in terms of brands atomizes people- existing in tension with the collective. Collective experience, religious, social, and economic, is essential to existence. When we are together, concepts like equality and dignity have meaning. For me, Unitarian Universalist spaces allow refuge from a world where nearly everything has adopted a corporate mindset. The campus that we had this meeting on is in crisis because the administration has become more like corporate executives and less like public servants. What I ask here is to think about identity, and then personal branding. To you, are they similar, or not? What unites or separates the two? Fifty years ago today, Rev. 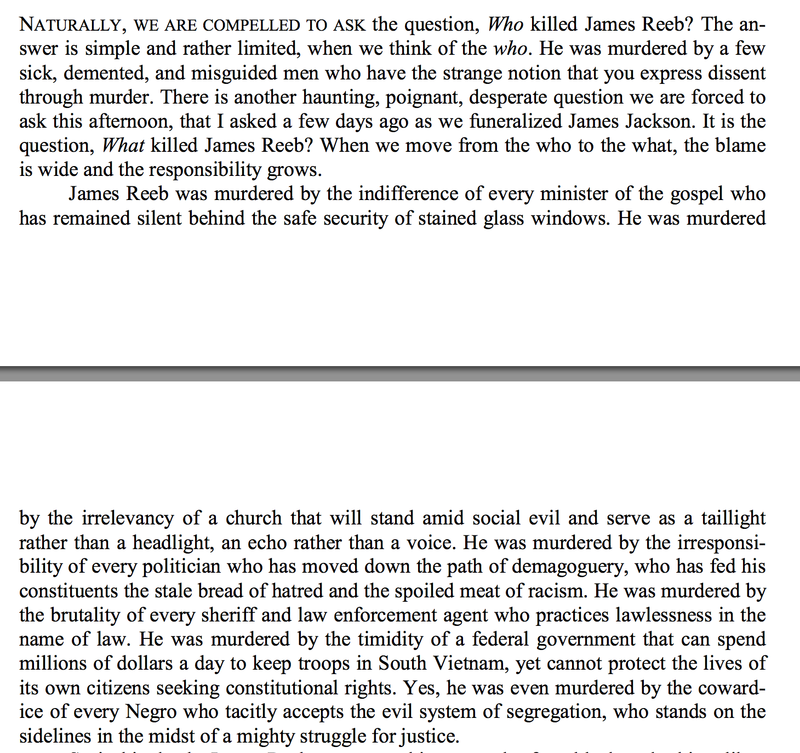 Dr. Martin Luther King Jr. gave the eulogy at the funeral of Rev. James Reeb, a Unitarian Universalist minister who came to Alabama in response to King’s call for clergy to stand up for racial justice. He was murdered in Selma outside a cafe, where he was walking with two other UU ministers. The text of the eulogy is now available (PDF), and it is as expected a textbook example of King’s grasp of imagery and lyricism. King expertly transforms Reeb’s death from a single crime to a structural injustice by moving from who killed James Reeb, as what killed James Reeb. It is a fitting eulogy to a UU minister. Those with true religious courage and spirit leave their churches, temples, and places of worship, to speak truth and stand for justice. The Civil Rights Movement needed real tangible support, not idle words. Those that died in Selma saw religious obligation existing at the frontlines. Earlier this month I moved from Northern to Southern California. Exciting, a bit uncomfortable, but San Diego is a place of great promise and opportunity. Starting this week I will be a new transfer student at the University of California, San Diego; since I know very few people here, the half dozen local Unitarian Universalist congregations are a great starting place. Getting integrated into the community, both on a social level and as an activist, is deeply important. So I’ll be doing a write up of each place I go. 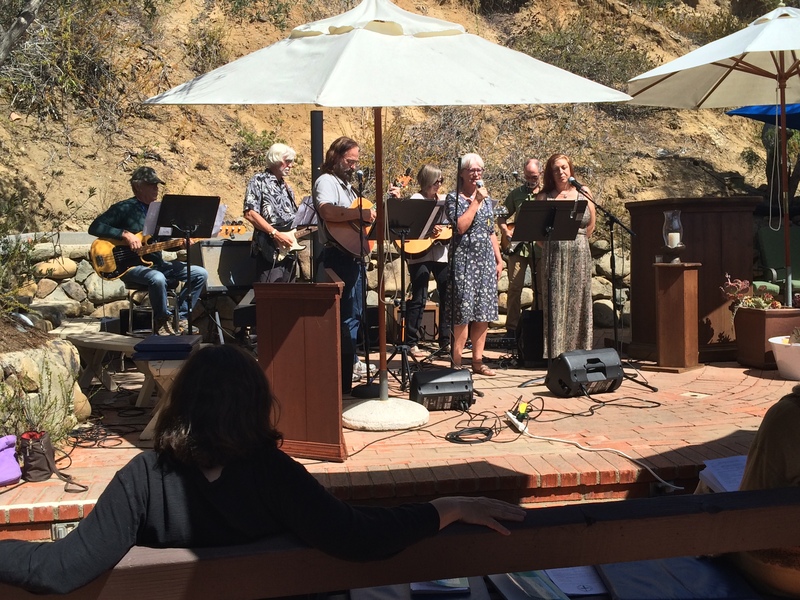 Unitarian Universalist Fellowship of San Dieguito (UUFSD, website here) is located in the hills of Solana Beach, just east of I-5. It typifies all things Southern California. The landscaping is arid shrubs and drought-resistant trees, the buildings are of grey stone and of the flat, pueblo style. What gives it a unique flair is the outdoor amphitheater where services are held, weather permitting. A hemicycle of benches surrounds a modest red-brick stage, its back butting up against a sandy hill. Beach umbrellas shield most congregants, though if one is quite pale and sensitive to sunlight (your truly fits the category) you may have to keep shifting in order to match the rising sun. The centerpiece of the 11am service was the coming of age program, where youth start the transformation towards having their own ideas about meaning and spirituality. In total there were twenty-five teens moving forward to the next stage, an impressive amount given my original congregation had serious issues with an imbalance between elderly and youth congregants. Overall it felt like the “moving up” days of my early schools years; this was not a graduation but more an acknowledgment of progress and the foundation of future work. Rev. David Miller, who like many in the UU tradition has the ministry as a second career, gave a speech entitled “The Edge of Reason: Faith in an Unreasonable Age”. It dealt with the great clash in society and within all UU congregations- how does reason interact with faith, science with mysticism? He called attention to the waste that comes with hair-splitting and semantics, and that ultimately what science and religion do for individuals and the world is more important than whose ideas are better. 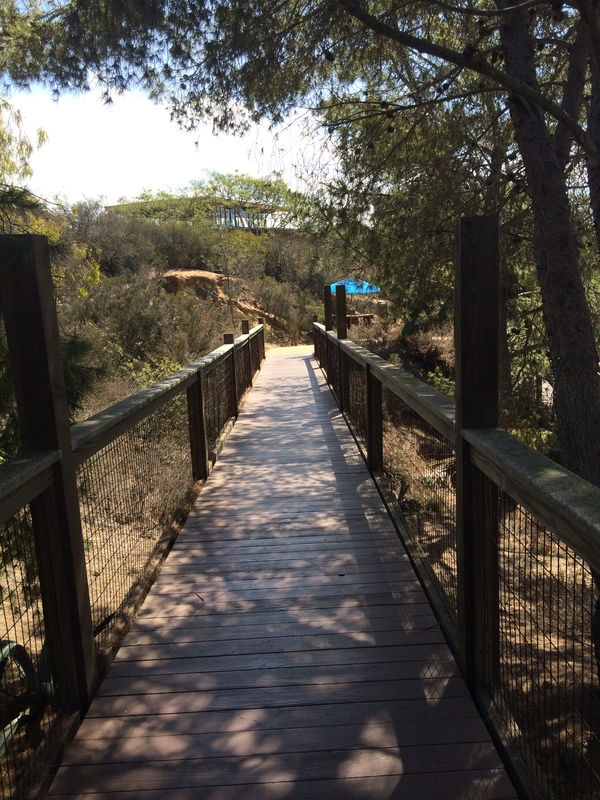 Walkway between amphitheater and building complex. His point regarding the ‘edge of science’ and what can and cannot be proven was well taken. It reminded me of an article recently put in a Scientific American compilation called “Does the Multiverse Really Exist?” by George F.R. Ellis (PDF here). Multiverse- the idea that there are other universes outside of our own, in some structure- reaches the edge where physical theories become metaphysical conjecture. Ellis points out that if there is no way to test for a multiverse, and the theory is not provable nor falsifiable, there is no place for science. Rev. Miller illustrates that we must not lean on science for everything, because its method has only so many uses. But also, implicitly, that superstition and dogma cannot creep into the territory that science can explain. As one hopes, the congregants were very welcoming. I was offered the chance to introduce myself early in the service and took it. Rev. Miller pointed out that given my shirt (this one from Northern Sun, only with the old logo) I was probably not a stranger to the religion. Several people came and talked about their history at UU of Palo Alto, where I came from. It was nice to talk to people from Southern California and get a sense of what the community is like down here. Members were also helpful about other congregations in the area. 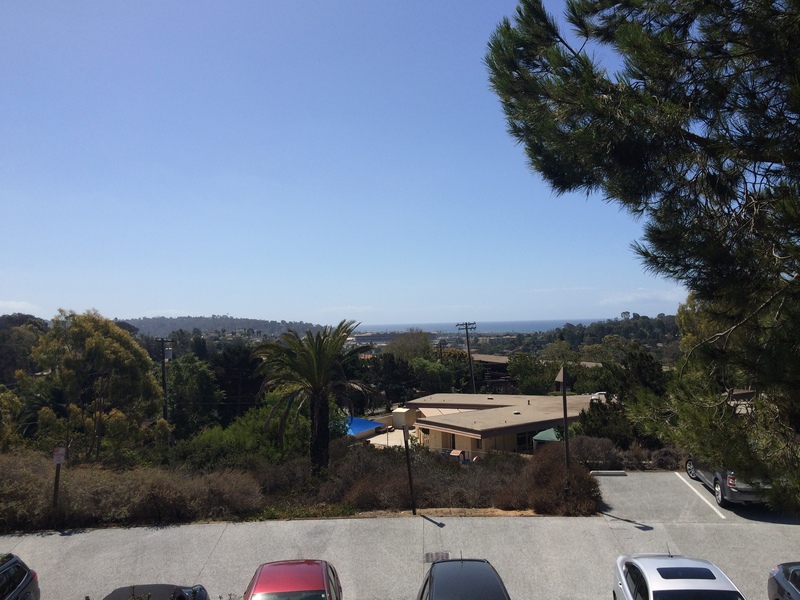 View towards the Pacific from the campus. I plan to visit all the congregations in the county (five of them, with the largest one in downtown having a branch with overlapping content), and this was an encouraging start. The low-70s weather was perfect for outdoor worship, and the campus itself has character. What the amphitheater had was character- not run-down, but also not sparkling and impersonal. Given that I only have one class this week, I should be ready for a new congregation next week- Palomar Unitarian Universalist Fellowship. Edit: I ended up going to the First Unitarian Universalist Church of San Diego for that Sunday. The piece on that visit is here. Sunday I received a Presidential Dollar coin. 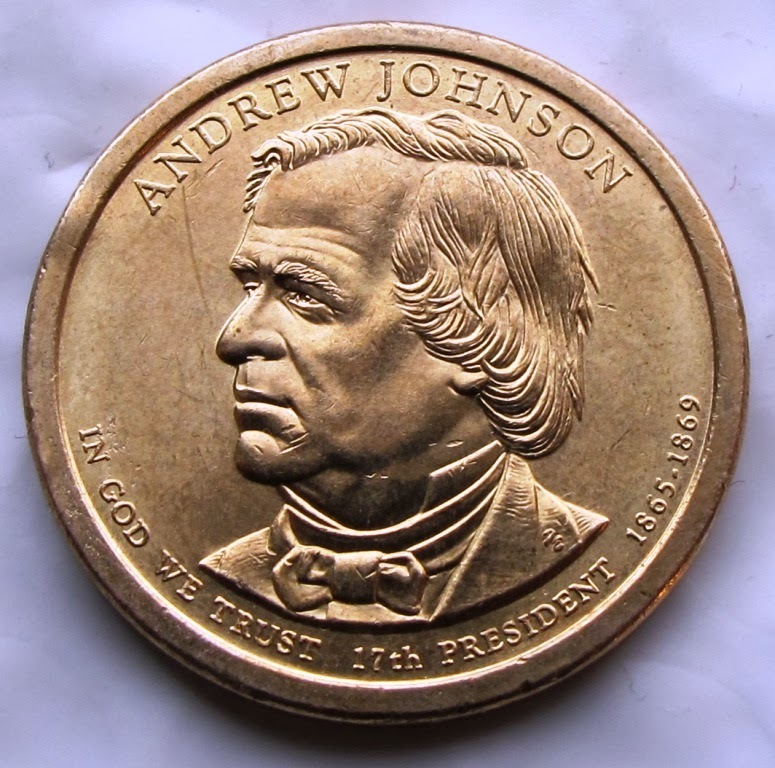 Andrew Johnson, one of the most incompetent and ineffectual executives in American history. Everyone else in the congregation received their own coin- Washington, Adams, Jackson, Lincoln, Grant. Some of the older Sacagawea designs as well. This was an attempt to drive home the sermon’s main point on money- that money is just another name for power. And in the current economic system, using money is exerting power. It buys goods and services. It influences people’s emotions, ideals, and motivations. It separates groups of people into classes and castes. So I still have this coin, despite having options to use it. I’ve paid for transactions in cash, passed tip jars and fountains. But it’s still here. Even as just one dollar, there is something profoundly unsettling about being given money you did not earn or ask for. Since the coins were provided by the lay member giving the sermon and not the church, I can’t view it as a rebate or credit for my church giving. How do you deal with random money? Randomly, I suppose. It’ll end up with the first homeless individual I encounter. This dollar is not only unearned and unasked for, but unneeded. Money gains its greatest value when it’s used to meet clear needs for people. And there are always those in need.